Armored liquid-in-glass test thermometers. #14 gage test thermocouples. Bimetal test thermometers. 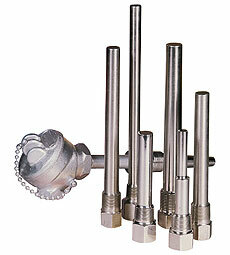 1/2" NPT external thread is standard. When extra head length is required to extend through insulation, 2 1/2" lagging extension is standard. Brass (ASTM B-16), Carbon Steel (C-1018), A.I.S.I. 304 & A.I.S.I. 316 Stainless Steel. Other materials available on request. Cap and Chain: Captive plug & chain is furnished on all wells as standard. * Material – 304 SS, Carbon Steel, etc. Used where short insertion length is necessary as in short legs of tees, etc. This well also fits the 2 1/2" length bimetal thermometer with 1/4" stem diameter. 3/4" NPT and 1" NPT external thread. Brass (ASTM B-16), Carbon Steel (C-1020), A.I.S.I. 304 & A.I.S.I. 316, Monel. 15/8 per 1 5/8 in.